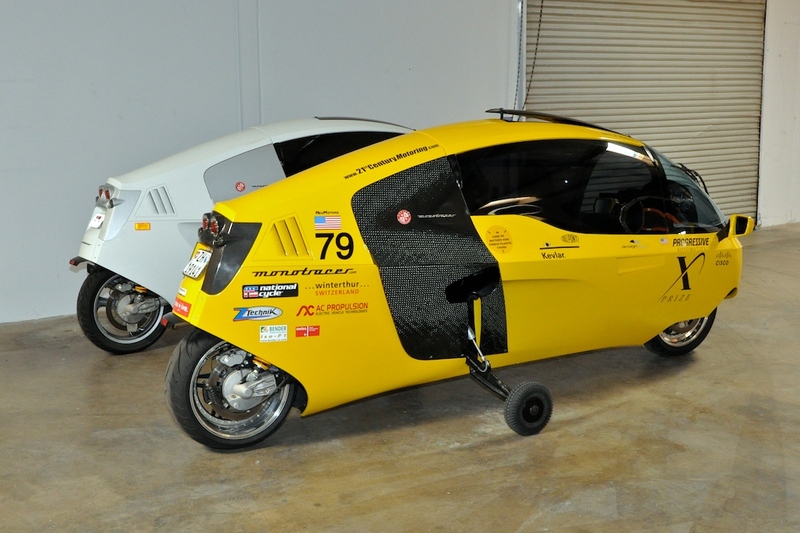 Team X-Tracer was invited to the SEMA Show in Las Vegas to display the X PRIZE winning E-Tracer #7009. After thinking about the logistics of getting the vehicle from Los Angeles, CA to Las Vegas, NV, we decided to drive the E-Tracer there under its own power! Our west coast tradition of not trailering AC Propulsion EVs to EVents continues. When discussing EVs in Southern California a question that frequently is raised is “Can I drive it to Las Vegas?” The E-Tracer is definitely an EV that you can drive to Las Vegas. MonoTracer and E-Tracer await their Los Angeles, CA to Las Vegas, NV journey. San Dimas to Barstow 98.4mi leg averaging 125Wh/mi. Jim Lorimer, our North American sales representative, was Roger’s wingman and drove our west coast MonoTracer demonstrator to Las Vegas in formation with the yellow E-Tracer. Roger and Jim departed Sunday morning from San Dimas, CA and headed towards Barstow, CA where they stopped at the Barstow Calico KOA campground in order to grab an hour of charge from an RV power pedestal. This campground is EV friendly (ask for Donna) having set aside a NEMA14-50R power pedestal for use by transiting electric vehicles. Roger averaged a respectable 125Wh/mi on the 98.4mi initial leg to Barstow consuming only 12.4kWhrs. The next leg would be over 150miles from Barstow to Las Vegas passing through Baker. E-Tracer topping up a charge at Barstow KOA. 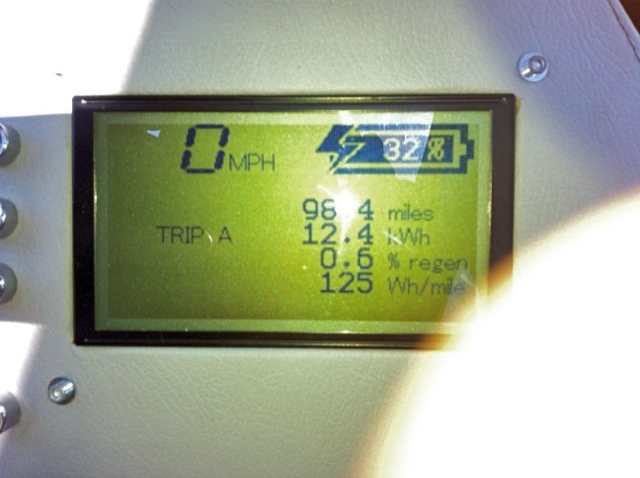 E-Tracer final trip mileage, energy consumption, and efficiency upon arriving in Las Vegas, NV. The E-Tracer made the long ~150mi leg on I-15 from Barstow to Las Vegas without a hitch. 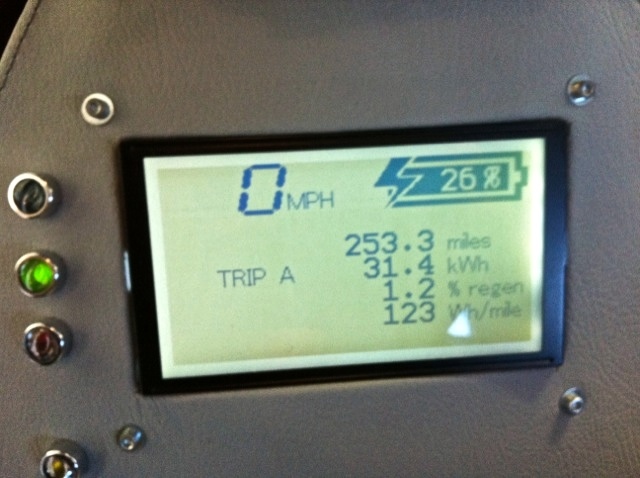 The total trip mileage was 253.3mi, 31.4kWhrs consumed, and an average 123Wh/mi which works out to approximately 280MPGe. It is quite possible the E-Tracer’s drive to Las Vegas is one of the most efficient of any vehicle that has ever traveled this route. If you’re in Las Vegas this week (November 2-5), stop by to say hi and check out the E-Tracer at the X PRIZE booth. You might also spot the white MonoTracer driving up and down the strip. Roger snaps a view from the yellow E-Tracer of the white MonoTracer piloted by Jim while traversing I-15 on the way to the SEMA Show in Las Vegas, NV. This entry was posted in Peraves, PIAXP X PRIZE and tagged AC Propulsion, E-Tracer, Electric Vehicle, I-15, Las Vegas, PIAXP, SEMA Show, X PRIZE. Bookmark the permalink. I just visited Barstow yesterday and I got a good impression of that part of the desert, but now my opinion is better since you can charge ur EV right there, Love it!! !